Reference number for this case: 18-oct-54-Pont-l'Abbé-d'Arnoult. Thank you for including this reference number in any correspondence with me regarding this case. The press, such as the newspaper L'Alsace for October 20, 1954, reported that at Pont-l'Abbé-d'Arnoult, a mysterious craft that rose vertically behind a hedge was seen by Mr. Meunier, site manager in a masonry company. Some sources add that he had never been so scared, not even during the war. In 1979, Michel Figuet adds an hour: 07:00 p.m.
Rome, Oct. 19. -- The flying discs continue their saraband in the sky of the peninsula and in Capri, one of these mysterious machines landed on the terrace of writer Curzio Malaparte's villa. It is a painter, Mr. Raffaele Castello, who, during a night walk carried out at cape Massulo, saw an enormous disc approximately five meters in diameter, which moved at a hundred meters of altitude. The apparatus went down slowly and landed on the terrace of the villa of the writer. Mr. Castello who initially thought it was a helicopter approached the summer residence of Curzio Malaparte and was very suprized to see four men of small size going down from the disc. The passengers of the machine, who were clad in an outfit, remained around the disc approximately half an hour. "I had the impression, the witness of this landing said, that they did not speak, or then they spoke with low voices, as from place where I was, I was unable to hear any sound. What is certain, is that bluish gleams escaped without stop from the disc, similar to pins and fast like lightinings, leaving in all the directions. "After some time, half an hour approximately, the four men returned into the disc which, with a gentle humming, rose gently, perpendicularly, and took altitude quickly". Livourne, Oct. 19. -- Bruno Senesi, 34 years old, who entered yesterday evening at the hospital of Livourne, ducked under a bed while shouting for help. He states that Martians had just gone down from a saucer and were chasing him. Paris, October 19. -- Several testimonys on the overflight of France by mysterious machines come from the West. In the Côtes-du-Nord, in Uzel, Mr. and Mrs. Perrichon stated to have seen, yesterday evening, a flying saucer of orange color. The same fact was observed in several nearby cities. In the Vendée, in Pont l'Abbé d'Arnoult, a mysterious machine which rose vertically behind a hedge, was seen by Mr. Meunier, site foreman in a building firm. Lastly, in Luçon, Mr. Boulineau observed a large luminous ball of which a part in form of crescent was of red color. The ball moved quickly, while rotating and disappeared in a few seconds. Lisieux, October 19. -- Several people ran through fields in Moyeux, in direction of a flying saucer, surrounded of white smoke, which had been reported to them by a child. The author indicates that on October 18, 1954, in Pont-l'Abbé-d'Arnoult in the Charente-Maritime, "one does not know what they saw." He indicates that only Paris-Presse for October 20 mentions this case without giving even one detail, that it is impossible to go up to the source and not even possible to check the date. Mr. Meunier, a construction supervisor, was terrified by a strange craft, which rose vertically from the ground. He said he had never been so afraid, even during the war. (P 73; M 196). The two authors indicate that with Pont-l'Abbé-d'Arnoult, in the department of Charente-Maritime, on October 18, 1954 at 07:00 p.m., Mr. Meunier was terrified by a strange machine which rose vertically from behind a bush. The witness indicated that he has never been so afraid, not even during the war. The sources are indicated as case 283 of the Vallée catalogue; La Croix and Paris-Presse for October 20, 1954; A. Michel in "A Propos des S.V." page 196. In another case on the 18th a "strange craft" greatly surprised a M. Meunier, a construction supervisor, who swore that even his war time experiences had not frighten so much as this sighting. 146. 146. La Croix. 20 October 54. The Belgian ufologist indicates that in 1954, on October 18, in France, in Pont l'Abbé d'Arnoult "Mr. Meunier, site foreman, was terrified by a strange machine which rose from the ground vertically. He ensured he was never frightened that much, even during the war." The sources are indicated as "La Croix, Paris-Presse, 20 oct 1954" et "Jacques Vallée: 'Chronique des apparitions ET' - DENOEL 1972 - J'AI LU COLL. - p. 285". In Pont-l'Abbé-d'Arnoult (France), Mr. Meunier (site foreman) is terrified by a strange machine which rises from the ground vertically. He ensures he was never so frightened, not even during the war. The sources are indicated as "La Croix, Paris-Presse, 20 octobre 1954". Luc Chastan indicates that in the Charente Maritime in Pont l'Abbé d'Arnoult on October 18, 1954 at 19:00 hours, "a witness is terrified by a strange machine which rises behind a bush, vertically. He ensures he had never been so afraid, even during the war." The website indicates that on 18 October 1954 in Pont l'Abbe d'Arnoult, France, "A strange craft rose vertically from the ground." "At Pont l'Abbe d'Arnoult, France Mr. Meunier, a construction supervisor, was terrified by a strange craft, which rose vertically from the ground. He said he had never been so afraid, even during the war." And: "Mr. Meunier, a construction supervisor, was terrified by a strange craft, which rose vertically from the ground. He said he had never been so afraid, even during the war. One ball was observed (Meunier)." The website indicates that on 18 October 1954 at 19:00 in Pont-l'Abbe-d'Arnoult, France, "An object was sighted that had an appearance and performance beyond the capability of known earthly aircraft. One object was observed by one male witness in a pasture (Meunier)." The sources are indicated as Michel, Aime, Flying Saucers and the Straight-Line Mystery, S. G. Phillips, New York, 1958; Bowen, Charles, The Humanoids: FSR Special Edition No. 1, FSR, London, 1966; Vallee, Jacques, Computerized Catalog (N = 3073); Vallee, Jacques, Preliminary Catalog (N = 500), (in JVallee01); Vallee, Jacques, A Century of Landings (N = 923), (in JVallee04), Chicago, 1969; Schoenherr, Luis, Computerized Catalog (N = 3173); Hatch, Larry, *U* computer database, Author, Redwood City, 2002. Didier Charnay informs that the article "Sacrés OVNIS" in the newspaper "Sud-Ouest" for July 16, 2009, mentions the case of Pont-l'Abbé-d'Arnoult. *Oct. 18, 1954 – At Pont l’Abbe d’Arnoult, Charente-Maritime, France Mr. Meunier, a construction supervisor, was terrified by a strange craft, which rose vertically from the ground. He said he had never been so afraid, even during the war. (Sources: Aime Michel, Flying Saucers and the Straight Line Mystery, p. 196; Jacques Vallee, Passport to Magonia: A Century of Landings, p. 233, case 283). Mr Meunier a construction supervisor was terrified by a strange object that rose vertically from the ground. He said he had never been as afraid as this, even during the war. Vallee Case 283 citing La Croix + Paris Presse both 20 October 1954. On March 7, 1962 Pont-L'Abbé was renamed Pont-l'Abbé-d'Arnoult. Was it a meteor arriving visually for the witness from behind the horizon? 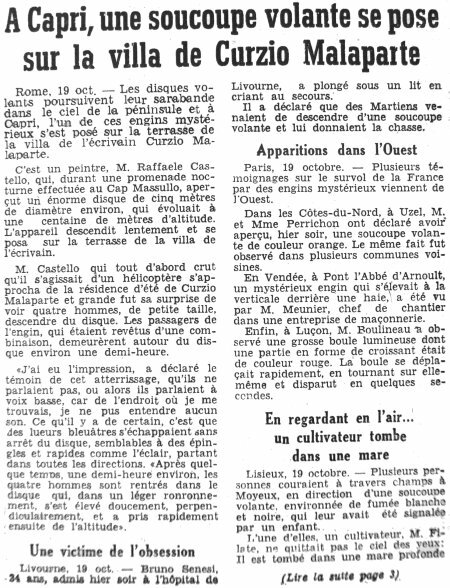 [la1] Article in the regional newspaper L'Alsace, Mulhouse, France, October 20, 1954. [am1] "Mystérieux Objets Célestes", book by Aimé Michel, Seghers publisher, France, page 261, 1976. [fr1] "OVNI, Premier Dossier Complet des Rencontres Rapprochées en France", book by Michel Figuet and Jean Louis Ruchon, Alain Lefeuvre publisher, France, page 186, 1979. [lg1] "The Fifth Horseman of the Apocalypse - UFOs: A History - 1954 October", monography by Loren E. Gross, USA, page 61, 1991. [---] "Sacrés Ovnis", article in the regional newspaper Sud-Ouest, France, July 16, 2009. [dc1] Ovnis Médias News, electronic bulletin by Didier Charnay, France, #47, July 24, 2009. 1.0 Patrick Gross June 6, 2009 Conversion from HTML to XHTML Strict. First formal version. Additions [am1], [go1], [jb1], [lc1], [ud1], [ud2]. 1.1 Patrick Gross June 8, 2010 Additions [la1]. 1.3 Patrick Gross July 9, 2010 Additions [dc1], [fb2]. 1.4 Patrick Gross October 18, 2014 Additions [ni1]. 1.5 Patrick Gross February 11, 2017 Additions [lg1]. Addition of the Summary. 1.6 Patrick Gross March 3, 2017 Addition [ub1]. 1.7 Patrick Gross January 20, 2019 Additions [pr1], [mf1], [pr2], Summary. In the explanations, "Not looked for yet" replaced by "Was it a meteor arriving visually for the witness from behind the horizon?"